Blackbird was not written in one place, at one time, in one way. It came together in bits and pieces over the course of 17 years, on at least seven different computers that I can think of. The writing was spread out across four different states, in at least two dozen different places including various apartments and homes, bed and breakfasts and hotel rooms and airports. Parts of it were written in Microsoft Word, Google Docs, BBedit, Notepad++, Adobe InDesign, and Scrivener. Things have gone a bit more smoothly for my more recent efforts. 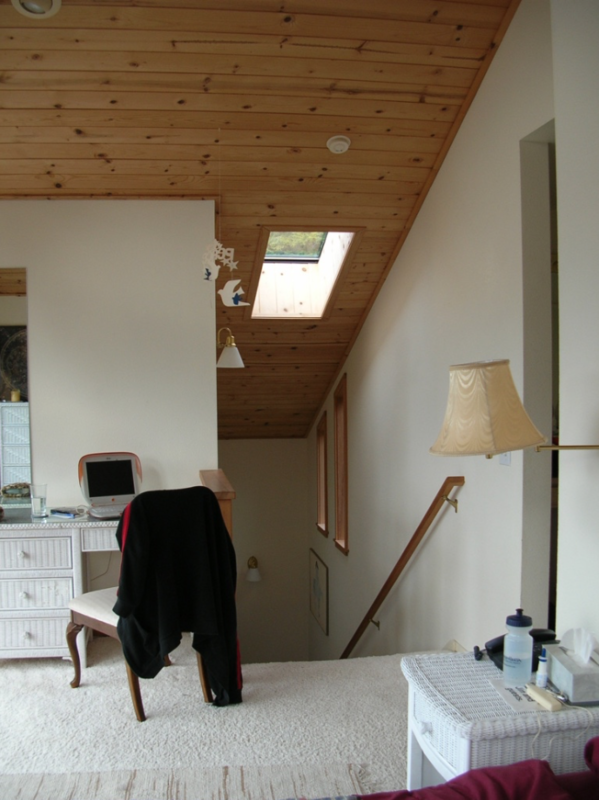 Owning a house has made it possible to establish a writing space that isn’t going to disappear in a couple of months, and all that experimentation over the years has made it possible to find a setup that works. Ironically, what’s worked for me was building a certain amount of flexibility in. For the past five years or so, I’ve primarily worked off of a standing desk that I built myself, piecing together a regular “corner desk” from Office Depot and some bookshelves from Target that were just the right height. Together with a drafting chair from a local furniture store, this gives me the ability to transition from sitting to standing just by sliding my chair out of the way. 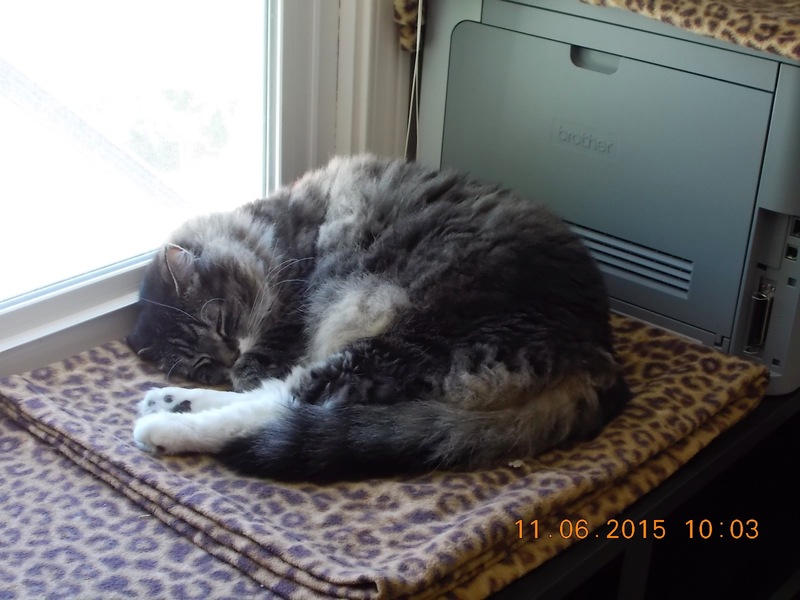 It’s been a great help for my lower back and keeps me moving even while I’m in the middle of writing. My main desk setup also involves two monitors, one being that of my laptop which I’ve got propped up to one side on a simple L-shaped wooden frame I made in the garage. The main monitor screen is where I keep my focus, and if there’s something I need to pay occasional attention to (like the Slack chat I write SwearTrek captions in, or the Writer’s Block Discord server), I can keep those windows off to one side for an occasional glance. If they get distracting I just dim the laptop screen to black. I also have a second desk setup, this one being a treadmill walking desk with a PC laptop. You might think that it’s difficult to write while walking, and it admittedly takes a bit of practice, but once I found the right desk height it was actually pretty simple to figure out, and I can type at full speed even while walking up to 3 MPH. 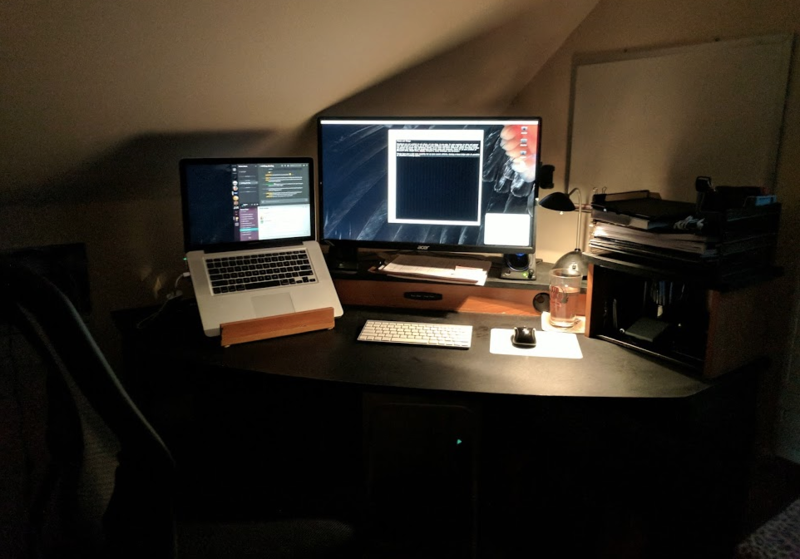 I have a similar two-monitor setup on this desk; technically it’s three, but here I keep the laptop out of sight off to one side since it doesn’t fit nicely on the desk. Scrivener and Google Docs are the primary tools that made it feasible for me to actively swap between a PC and a Mac while I stand, sit, or walk as I desire at the time. I likewise swap between those tools depending on what I’m working on. If it’s something relatively short, or if I need to collaborate on something like a role-playing game with my partner-in-crime Jerry Grayson, I’ll use Google Drive so we can work on the same Docs and Sheets simultaneously if needed. If it’s a longer work, such as a novel, I’ll work exclusively in Scrivener whenever possible, since the documents transfer between Mac and PC rather seamlessly. Scrivener was something I stumbled across rather late in the process of writing Blackbird; if I’d found it sooner, I might very well have finished the novel sooner. The way it acts like a binder full of notes and clippings, the way it lets me divide things into parts and chapters and scenes, the way I can store previous drafts and character bios and maps, the way I can view two chapters simultaneously next to one another… all of these are things that just clicked with the way I like to work. When it comes to layout and publishing, Scrivener docs necessarily need to be turned into Word Docs or raw text to pour into InDesign, but during the actual writing process, it’s been invaluable to me to just stick with Scrivener. Another little tool that’s helped quite a lot is f.lux, which is a screen-dimmer that you can set to reduce the amount of blue light coming out of your monitors after sunset. As with Scrivener, it’s not a tool that I’d use while doing layout or any sort of design work, since it alters colors significantly. But while writing at night, which is when I do much of my writing nowadays, f.lux has helped reduce eye strain quite a lot, and it certainly seems to have helped me fall asleep faster, giving me more time to dream up new stories to work on. The final piece of my writing puzzle is related to those dreams, in fact: the white boards that I have up in my office on ever available flat surface. While they’re also great for writing notes and brainstorming during the day, they’re also invaluable if I wake up in the middle of the night with an idea that just won’t wait. I can grab a marker, scribble down a note, then stumble back to bed. Usually I can decipher my own handwriting, too. White boards are one of those things that seem too expensive to acquire, but a great place to find them really cheap is at a local thrift store like Goodwill or Salvation Army. They’re usually kept over by the furniture, and more often than not you’ll find at least a couple of them selling for just a few dollars a piece. With this basic setup in place, I was able to churn out the first drafts of three novels in just about 5 months last winter. With Blackbird wrapping up, I’m currently using this same setup to begin edits and rewrites on one of those novels–one that definitely won’t take 17 years to complete! Once I’d finished writing Blackbird, it took quite a while for me to figure out that I hadn’t finished writing Blackbird. I realized that I had only written a first draft, of course, and took appropriate actions: I selected some friends to be my “beta readers” and sent them some proof copies using Lulu.com. Then I eagerly waited throughout August and September for those proofs to be returned to me, covered in edits. But despite all that I was still convinced I was nearly done. I really wasn’t. Not even close. My beta readers offered enough critical feedback (some of it exactly the sort of savagery that I needed to hear) for me to work with. On November 22, 2009 I dived back into the manuscript and edited away, and just after Christmas I started submitting to agents. Although I’d had a book published before (the Ninja Burger Handbook), I’d never worked with an agent before, so figuring out this part of the process took some time. I knew that it wouldn’t be a quick process, and I was right. In most cases weeks or months went by before I heard back, and initially the answers were all a polite “Not right for us” if I heard back at all. I kept myself busy, regardless. I began searching for voice actors to play the roles of Edison and Christian in a sort of radio play I hoped to put together, and I finished this project off in early June of 2010 while working for NCsoft on the Aion MMO and suffering a case of what the doctors thought at the time might have been Mumps(!). Shortly thereafter, my frustration at the long search for an agent beginning to set in, I uploaded a new draft of the novel to Amazon’s CreateSpace in July and ordered a copy to see what it looked like. I fully intended to self-publish once I got back from my trip to Gen Con. 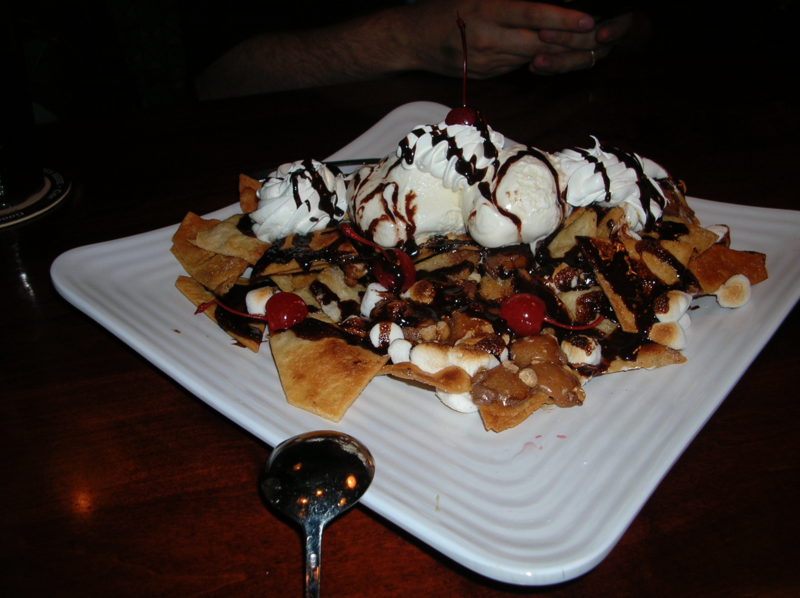 Instead, on August 6—right around the exact time I was enjoying the dessert you see here—I got an email back from Chris Kepner at Victoria Sanders & Associates (who I had queried on June 9). He apologized for the delay and asked to see the full manuscript, which I emailed back around 2 AM. By the time my birthday rolled around in mid-September I was signed on with the agency, we’d done some additional editing, and my manuscript was being circulated among the big publishing houses. It soon became apparent that this wasn’t going to be a quick process. Months went by. Before I knew it nearly a year had passed, and it was in June of 2011 when Chris and I really sat down and looked at the feedback we were getting from publishers. The general consensus was that the novel was too long for anyone to take a risk on. We did the math and decided that if I could cut my 146,000 word novel down by about 30,000 words, we’d have a much better shot. So despite my reservations that’s exactly what I did. I worked with a fabulous editor by the name of Jennifer Schoonover to do some cutting of extraneous words, and then I took the manuscript and prepared to do the hard work of fixing some problems with the story that needed addressing before we could resubmit. And then I got a job with a game company called KIXEYE, first as a community manager and then as a sort of anti-cheating specialist, and I got more insanely busy than I could have ever imagined. As a result, Blackbird kind of went on hiatus for a while. In late August of 2011 I informed Chris that it was going to be a while before I could deliver a properly edited manuscript, and then time just rolled on. It would be May of 2013 before I had anything close to a solid edit ready, and it would be March of 2014 before we had something that Chris could start shopping around again. Finally in April of 2016—after a ton of hard work and persistence—we got a bite from a publisher who was interested in signing me on if I would be willing to consider trimming the novel a bit further: from 114,000 to about 95,000. That publisher was Skyhorse, and after hacking away at Blackbird all summer long, I finally signed on with them in September of 2016. There was more editing after that, of course. Most of the final editing happened in the Spring of 2017 after my editor Chelsey Emmelhainz finally got a chance to dive into the book (mine was hardly the only book she was editing), but there was plenty to keep me occupied along the way: selling foreign rights, working on cover design, and beginning to work on a publicity plan. My long stint with KIXEYE had led me to drop off the Internet, since part of my job involved chasing down hackers and cheaters who were equally interested in tracking me right back. My disappearance unfortunately happened to coincide with social media truly coming into its own, and I needed to get back up to speed, something I continue to do to this day. The rest you may already have read about (I hope). We finalized a manuscript for Blackbird this past summer and began sending out Advance Reader Copies (ARCs) to get blurbs and reviews. I brought in some additional help with publicity, started writing this blog, had a successful Goodreads giveaway, and have an AMA (“Ask Me Anything”) session planned on Reddit for a few days from now (as I write this). All in preparation for the novel’s ultimate release on November 7, 2017. The feedback we’ve received from early readers has all been tremendously positive and I am cautiously optimistic that people will enjoy reading Blackbird. It’s been an incredibly long journey and I had my doubts, but in the end I’m really glad it took as long as it did. Blackbird would not be the book it is today if not for the people who supported me along the way, all the feedback I got, all the editing I did, and all those who believed in the project even when I wasn’t so sure myself. If you’re curious, I’ve uploaded the original draft of the opening of Blackbird from July of 1999, with a link at the bottom to the version that will ultimately be published in November of 2017. Let me know what you think of how it’s changed over time! Blackbird was first brought into the world on July 6, 1999, and will finally be published on November 14, 2017. Quite a long journey, but to see only the bookends you miss much of what went into making it what it ended up being. Perhaps it’s only interesting to me, but then I’m probably the only one reading this, so that’s what this entry will be about. My recollections of the earliest days of working on Blackbird are the most sketchy. Not only was it at least five computers ago, but the early days were in an era before everyone stored everything forever. There wasn’t even any Gmail until 2004; when you started running out of space, you started deleting emails. Hence, a lot of things are a bit hazy. Nevertheless, tools like the Internet Archive do make it possible to piece together a rough picture of how things unfolded. The first 4-5 chapters of Blackbird were written in the summer and fall of 1999, then serialized online on a website I was running at the time devoted to “all things dark”. I wasn’t doing very much editing of these early chapters, just cranking them out and sticking them online for people to stumble across them. Initially this was mostly just players on the MUD I was writing for, called Iconoclast, but then I hooked a few early adopters of a website called Fark.com that I did some graphic design for. In early 2000 I moved cross-country to Silicon Valley, at which point Blackbird soon took a back seat to another little project of mine called Ninja Burger, which started spinning up in June of 2000 and didn’t really taper off until the mid 2000s. There were role-playing games, and the card game, and a comedy project which would become my first published book; plenty of things to distract me from finishing Blackbird. And that’s to say nothing of everything else that was going on: RPGs like Godsend Agenda and HELLAS; the dot-com crash and a period of unemployment followed by a bunch of job hopping; meeting my wife-to-be and then getting married; and so on. Regardless, I somehow managed to get through the first part of the story (set in the Washington, DC area) and nearly to the end of part two (which is set in Buffalo, NY) by the time the summer of 2003 rolled around, at which point the obvious thing to do was send the characters to San Francisco to live with me for a while. Episode 17—the first to be set on the West Coast—was penned in March of 2004, and Episode 24 (the last in Part 3) was written around March 31, 2006. In a few cases, I even know where I was when I wrote a particular chapter: in Fort Bragg, or on the Sonoma Coast, or in the Russian River valley. In-between those two chapters, a lot of little details from my journeys around the Bay area crept into the novel. 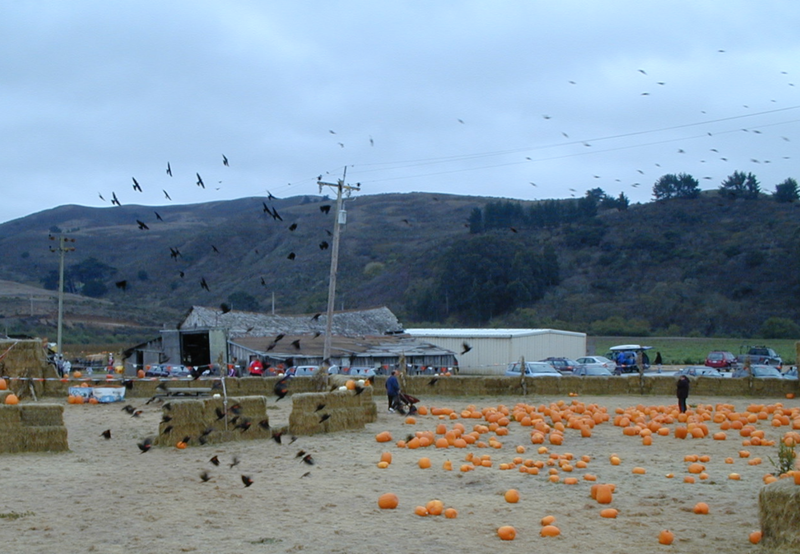 Scenes from a pumpkin patch overshadowed by a cloud of blackbirds, visits to various restaurants, and the like. I also started doing some heavy editing during this period of time, working on the relationship between the two main characters as well as some of the broader thematic elements. But I was struggling. I had taken Blackbird offline, and I had so much other stuff going on, it was becoming difficult to find my way. Two important things helped me along at this point. First, I moved the “Chronicles of Edison North” onto Livejournal, where they were exposed to a somewhat broader audience as well as some old loyal fans who had continued to express interest in seeing me finish Blackbird. Secondly, on January 20 of 2007 I began using an application called Scrivener to organize my writing, instead of the Word document I’d been using to that point. 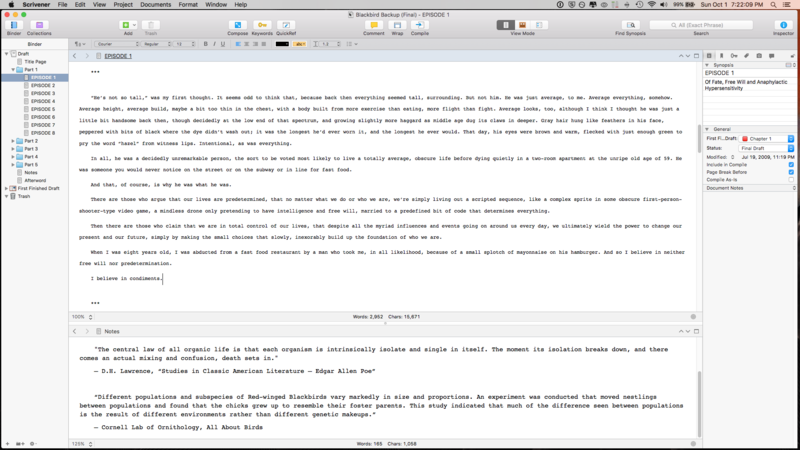 I can’t say enough about Scrivener; it helped me immensely, and by March I had a full outline of Blackbird through Episode 40 and a much better idea of where I was going. I’ve since used Scrivener to write three first drafts in 5 months (as opposed to the one draft in 10 years I managed with Blackbird), but that’s another blog entry for another time. In 2008 I moved to Seattle, and again the characters of Blackbird moved with me, this time moving at an accelerated pace. With everything outlined, I found it relatively easy to quickly finish off the part of the book set in Seattle, and in the summer of 2009 I traveled to the Origins Game Fair in Columbus, Ohio and found the perfect place to wrap up the novel. Now writing at a much faster pace, in May I opted to remove Blackbird from Livejournal entirely so I could polish it off, and that summer I did exactly as I hoped to do. The final chapter was inked on July 22, 2009 at around 1:00 AM. It had taken almost exactly ten years to write, and I was finally finished. But of course, I was wrong. This was not the end, just the end of the beginning. The first draft of Blackbird weighed in at roughly 146,000 words, and it still had a long way to go before—50,000 words and 5 chapters lighter—it would finally be published. Fast food seems to be a theme in a lot of what I write. In Iconoclast, a text-based MUD I wrote most of, I spent an inordinate amount of time implementing an assortment of fast food restaurants around the city of New Aurora, both in and out of the mall food court, despite the fact that most players never bothered to visit them. Of course, there was Ninja Burger, the fictional fast food chain run entirely by ninja, which was first just a silly website, and then an RPG, and then got completely out of hand. And in my novel Blackbird, not only does the opening scene take place in a fast food restaurant, but the main characters find themselves constantly drifting back to diners, drive-ins and dives. All of this may have some small amount to do with the fact that I’ve had fast food in my head for a very long time. According to my parents, my first solid food was McDonald’s french fries. And when it came to my first job, I didn’t have a paper route, and I didn’t mow lawns. Rather, I started working at McDonald’s when I was 14 and a half, which sounds like something out of Dickens but was actually perfectly legal in New York State. Minimum wage at the time was $3.35 an hour. 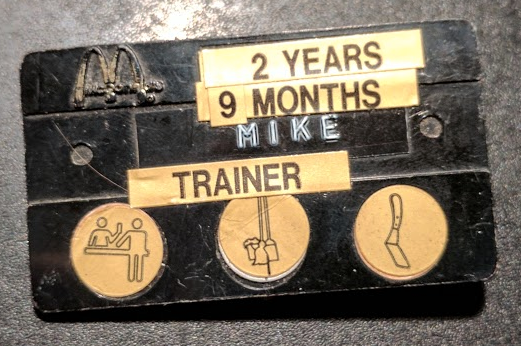 I started out on Counter, with occasional forays into Drive-Thru, and then as soon as I turned 16 I got moved into Grill and became a Crew Trainer. Through it all I got to witness the rise of the McChicken, the birth of the Breakfast Burrito, and the death of the McDLT. McDonald’s graded its stores every year, and the store I worked at scored the highest rating possible the three years I worked there. And every year, we would get personal feedback from the reviewers. When I was on Counter, people got their food promptly, change was made accurately, the tills were always 100% accurate, and the area was always spotless (ABC – Always Be Cleaning), but there was always one negative piece of feedback: I didn’t smile enough. No doubt this had something to do with them pushing me back into the Grill area as soon as they could. Before they did, however, I got to deal with the public on quite a regular basis. And not all of it was the sort of interaction that makes one inclined to smile. When it comes to the perspective of angry customers, the film scene that comes to mind most readily when you think of horrific fast food incidents is the “I want breakfast” scene from Falling Down, which apparently is celebrating its 25th Anniversary this year. It’s not that everyone regularly acts out like that, but that so many of them seem to want to (and many do, it seems, a phenomenon I’ve been semi-documenting over on reddit in the /r/ninjaburger subreddit. There seems to be a growing correlation between fast food and violence, especially in America, and from an abstract point of view it’s not difficult to see why. People are in more of a hurry than ever before, and it’s really easy to get frustrated and angry when your fast food isn’t fast enough, or your order is inaccurate, or the store policies don’t quite meet your expectations. 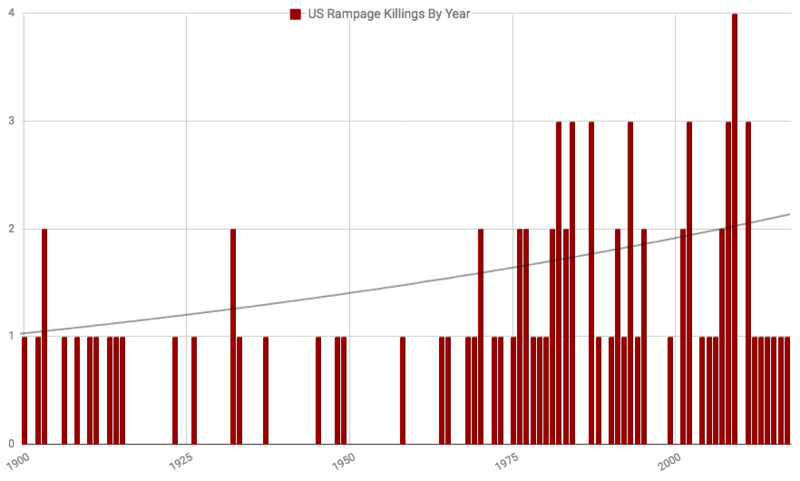 This is to say nothing of the larger incidents we’ve seen in our history which were triggered by larger societal ills but played out in restaurants, like James Huberty’s 1984 “McDonald’s Massacre” in San Ysidro, CA, or Georges Hennard’s 1991 “Luby’s Shooting” in Killeen, TX. Rampage killings happen in every country but for some reason it feels so very American when it combines violence and fast food. According to urban legend, Huberty also listened to Scandal’s “The Warrior” on the radio during the shooting, adding rock-and-roll into the mix. I wonder if he ate an apple pie too. During the time I worked in fast food, there was one particular repeat customer who stood out enough to stand in for my own personal “horror story”, even though it wasn’t anything close to what Falling Down depicts or any of the rampage killings documented in salacious detail on Wikipedia. The customer in question was a Vietnam veteran, which I knew because he told me more than once, and he was in every single day to order the same thing: “a large Diet Coke with no ice, and a large cup of ice with no Diet Coke.” No doubt he saw this as a clever way to get some extra Diet Coke out of the deal. And it was no big deal, for a while. Then one day, the order came down that we were not allowed to give out extra cups for free any more–we’d have to charge an extra nickel. I was the first cashier to have to break this news to this particular customer, and the first to witness him turn a vivid shade of red as he became incensed with rage over the prospect of having to spend a nickel for something that had been free the day before. He must have ranted for several minutes before paying the nickel, informing me that he would never again return to the store, no doubt with a few obscenities thrown in for good measure. I was 15 years old at the time. And I didn’t deserve that. But what it didn’t take long to realize was that the customer likewise felt that he didn’t deserve the treatment he was getting. From his perspective, he’d been a loyal customer, and (presumably) a loyal citizen, and all he wanted was some extra Diet Coke, or a free cup, depending on your perspective. It wasn’t like a nickel a day was going to make or break the store, or the corporation, or his pocketbook. But it wasn’t about the money, or the Diet Coke. It was for that customer about being treated (from his perspective) as something less than human. And the irony of that is that while he was ranting to defend his own humanity, he was completely failing to appreciate mine. I was as much a victim of the circumstances as he was. But in that moment, it didn’t matter. If McDonald’s was going to care about McDonald’s, he was going to care about his own needs. Who else was going to look after him, but him? In the end, he did come back the next day, and the next. And the next. And he paid his nickels for a week, and then someone decided that it wasn’t worth his constant outrage and we reverted to letting him have his free cup of ice, and he continued to visit until (I imagine) long after I quit and moved on up my personal career ladder. When I left, we were still charging 25 cents for an extra McNugget sauce, though. You have to draw the line somewhere. Blackbird is fictional, of course. The characters are not based off anyone in reality, and the opening scene is not intended to be set in any particular store, and I did not set out to recreate in part or in whole any real event. But the complicated relationship between stressed-out fast food customers and the people behind the counter with their all-too-often pretend smiles… there’s definitely some of that in Blackbird. Maybe I’d still have written the same novel if I’d never worked in fast food. But maybe not. They say you write what you know, and I learned plenty in my time at McDonald’s. It’s been decades now, and I’m sure a lot has changed, but I’m equally sure that a lot has stayed the same–in particular, that occasionally interesting interplay between customer and employee. There are good customers, and bad. And there are good fast food employees, and bad. And in the muddy mess you get by mixing up various combinations of each, I think therein lies a lot of what makes America what it is. And sometimes the line between sanity and outrage is as thin as a single coin. In late May of 1999, I moved from Buffalo, NY to the Washington, DC area. This wasn’t a one-shot thing; it involved a few car trips back-and-forth, in the ’88 Chevy Beretta I’d inherited. The first two trips went fine, but unbeknownst to me the car was on its last legs. And so it happened that on my way back to Virginia on the third trip, it overheated and died on the side of the road, just outside of South Williamsport, PA. Home of the Little League World Series, and, as it turns out, the place where my novel Blackbird really began. This was a time before everyone carried smartphones everywhere and always, so finding help meant walking back into town to find a store that was open, breaking a $20, and then figuring out who to call on a pay phone. There were some complications. First of all, that day—July 5—was an observed holiday, so just about everything in town was closed. 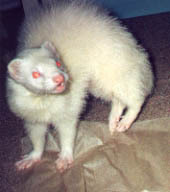 Secondly, I was not alone on my trip; I was bringing with me my pet albino ferret, Damien. This fact by itself was no big deal, but it was also damned hot outside, approaching 100°F (which explained why the car had died). There was barely any traffic on the road, and none of it was inclined to stop despite my attempts to flag someone down, so I really had no alternative: I rolled down the windows and left the ferret in the car as I jogged back down the road and found a convenience store, then started making calls. It took about an hour before I got hold of the owner of a garage, and managed to convince him to tow my car back to his place. We made it back to the car just in time to save the ferret from dying of heat stroke. I quickly checked us into a hotel which was kind enough to accept an unusual pet under unusual circumstances. Even though the ferret was now safe, there was another complication I had to consider. I had just started a new job two weeks earlier, and I had no way to let anyone there know I was having car issues, so it was imperative that I figure something out. I didn’t want to miss a day of work so soon, and I couldn’t really spend a week in South Williamsport while the car got fixed. So with the immediate danger out of the way, I left Damien to jump around on the bed with the air conditioning blasting and walked back to my car to see if it would start. It did. So I drove the car to the hotel, loaded everything back up, and got back on the road. And I made it another mile or so before it died again, for the last time. After another hotel check-in, and a dinner cobbled together from a poorly-stocked vending machine, I ended up finding a tow truck driver who was willing to tow me all the way down to Virginia. It was expensive, but I really saw no other option. We left right around dusk, and it was quite a ride. Country-western music on the radio, my dead car rattling behind us, a ferret squirming around in my lap, leftover fireworks bursting outside. We got home right around midnight, and after I unpacked, I collapsed, glad that it was over. But really, “it” was just starting. There were already some thoughts rattling around in my head, although I didn’t know it yet. Mostly unformed feelings. Frustration. Hopelessness. Anger at my own inability to control the uncontrollable. The next day—likewise hot and sunny—I managed to convince one of my friends to drive me to work, which was about 30 miles away; on the way back home I was on my own once again. This being olden times, there was no Uber or Lyft, nor was there even a convenient bus route. I had to call a cab, wait for him to take his sweet time showing up (he finally arrived around 8:00 PM, two-and-a-half hours late), then get him to drop me off at the nearest Metro station, then ride the Metro for 45 minutes, then walk a mile back to the house. By the time I got off the Metro, I was frustrated, and sweaty, and tired. And I was hungry. The closest option for a very late dinner was a fast food place on the other side of the street, so I waited for the traffic light. It only took a minute or so I’m sure, but it was enough time to think some more about how powerless I felt, while realizing that as much as the world was trying to eat me up, I was kind of the one in charge of my own destiny. I was the one pushing the button to stop traffic so I could cross, after all. An idea began to form in my head. Inside the fast food place, I ordered a plain chicken sandwich, fries, and a Diet Coke. And if they’d gotten that right, maybe things would have turned out differently. But they didn’t. They screwed up the order, and gave me a sandwich that was not plain. 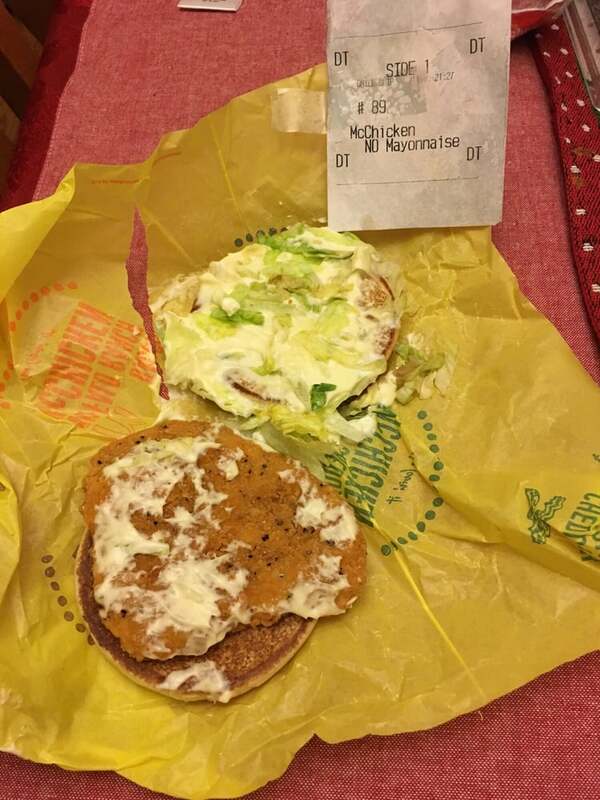 It had mayonnaise and lettuce on it, and had clearly been sitting in the heating bin for a while. I’m not allergic to either one—can you even BE allergic to lettuce?—but I find nothing more disgusting than warm lettuce covered in warm mayo. That’s not me, not at all; that’s not many people, and certainly none that I know personally. I knew deep down that this was a first world problem, before that was even an Internet meme. But the thought was brewing in my head, even as I used the edge of my french fry container to scrape off the mayo and lettuce, even as I started writing down my scattered thoughts on stray napkins: what if there WAS someone who would do what most people wouldn’t? Someone who would literally kill over mayonnaise on his sandwich? What would push him over the edge? I was already piecing a story together when the girls walked in, like something out of John Updike’s A&P. A half-dozen of them, all dressed in red bathing suits and towels, with the youngest one steadfastly ignoring the rule about bare feet. I watched them order their ice cream cones while I ate. And they got their ice cream and left, and I finished my dinner and left, and that was that. But I wondered: what if that barefoot little girl hadn’t gotten what she wanted? And what if this guy I had in my head had decided THAT was what it took to push him over the edge? The first chapter took about a day to write. The remainder took over a decade, but for everything that’s changed along the way, that first chapter has remained almost as it was envisioned on day one. And none of it would have been written at all if the pieces of the puzzle hadn’t aligned in exactly the right way at just the right time. Just random, individually inconsequential pieces of bad luck and happenstance. The condiments of life, so to speak. They say if life gives you lemons, you make lemonade. Life gave me mayonnaise, so I made Blackbird. Enter to win a copy of Blackbird through August 15, 2017 at Goodreads. Today is sort of the beginning of the end of the beginning. I started writing Blackbird, my first novel, on July 6, 1999, but while there’s clearly only one beginning, there were multiple endings. Drafts, revisions, times when I thought it was really done, times when I doubted. Now, though, the part where no one really knows about it but me and some close friends is really finally almost nearly over. With the Goodreads Contest running, several advance readers checking out the book, and the publicity campaign getting underway, there’s no turning back. When I started writing Blackbird, the Internet was a very different place. So many of the things we take for granted—Google, Facebook, Amazon, Twitter, Blogging and Social Media, even smartphones and tablets—either didn’t exist or were just getting started. Back then, you could do something wacky like start a website about ninja who deliver hamburgers and get a ton of attention. Back then, one of the best ways to spread the word about your novel-in-progress was to post the chapters in serial format on a popular website devoted to funny links. Back then, things were a lot easier, and a lot harder at the same time. While everything was busy changing, I was busy with lots of things; Blackbird was underway the entire time, but it wasn’t generally my number one focus. In addition to all things related to Ninja Burger, I was helping Fark.com out with graphics, writing columns and book reviews, designing role-playing games, working my way into the video game industry, moving cross-country and then cross-coast, and getting married, just to hit the highlights. And while I was doing some social media thingies—I had a LiveJournal for a time, and I was on Orkut and Friendster and a bunch of other sites no one really remembers any more—I wasn’t completely keeping up with social media trends. In fact, I sort of fell off the Internet about 5-6 years ago, just when a lot of things were peaking. Point is, I’ve got some ground to make up. Turns out that the hardest part of publishing a novel isn’t the writing or the editing or the actual publishing, it’s letting people know it exists. I have no idea what’s going to work. I’m on Twitter. I’m still on Facebook. I have a Pinterest, sort of. I’m on Goodreads. Somehow—gods only know how—I even ended up with a Wikipedia page. And now I have a blog again, the unfortunate reality of which is that the best time to have started writing one is always ten years ago, since you’re always starting from scratch as far as audience goes. I have no idea if anyone is going to read this. If anyone is going to care. But at the end of the day, I suppose it’s the same way with writing a novel. You just have to put it out there and see what happens. So let’s see what happens, I guess. Read, or don’t. Comment, or don’t. Email me or tweet at me. Let me know if you care and what you want to hear about. I’m going to be screaming into the void regardless. May as well say something amusing for the few people out there in the darkness who may be listening. Writer, game designer, ninja. 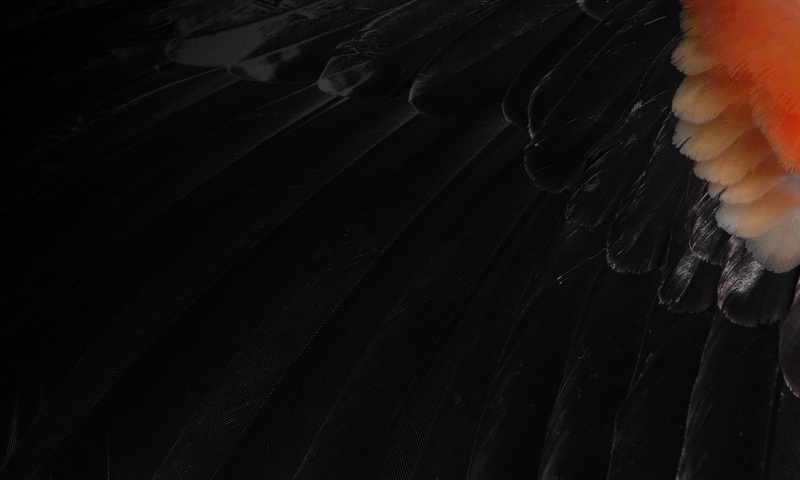 Debut novel Blackbird out in Fall 2017 via Skyhorse.